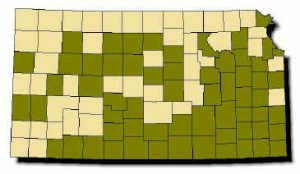 Range: Found throughout Kansas east of the High Plains; ranges west into the High Plains only along the aquatic corridors of the Arkansas and Cimarron river valleys. Description: Harmless. Scales keeled. 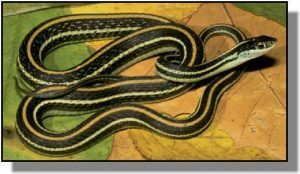 A striped snake, with a yellow or orange stripe down center of back and two, yellowish-cream colored stripes on the sides. These light stripes are separated by two wide, black areas along the back. Head is dark with two small light spots on the top. Belly is cream colored or very pale green. Young patterned like adults. Habits: Prefers to live near the edges of wetland habitats such as swamps, sloughs, marshes and oxbow lakes, but is also found along streams. Active March-October and breeds April-May. Gives live birth to an average of 12 young in August-September. Eats small frogs and fish.